Supporters praise San Juan commissioner, say his Recapture Canyon protest was legal and question jury's guilty verdict. 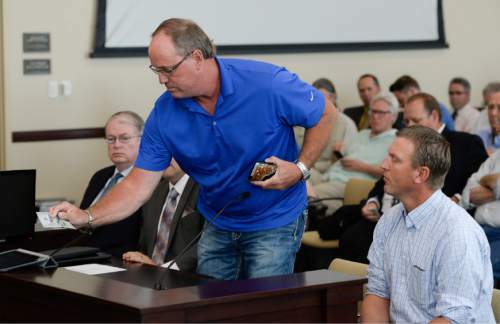 Francisco Kjolseth | The Salt Lake Tribune Rep. Keven Stratton expresses his support of San Juan County Commissioner Phil Lyman as members of Utah's Constitutional Defense Council meet at the Capitol on Wednesday, June 24, 2015, to hear Kanab Republican Rep. Mike Noel make a case for setting aside money for Phil Lyman's legal bills. In the end it was decided that money will be raised by private donations. Francisco Kjolseth | The Salt Lake Tribune Government and environmental law professor Patrick Shea takes to the stand to express his opposition to the actions taken by San Juan County Commissioner Phil Lyman. 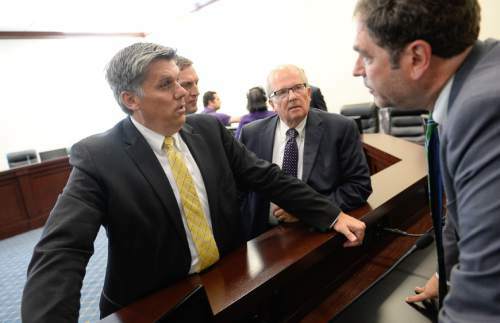 Members of Utah's Constitutional Defense Council met at the Capitol on Wednesday, June 24, 2015, to hear Kanab Republican Rep. Mike Noel make a case for setting aside money for Phil Lyman's legal bills. In the end it was decided that money will be raised by private donations. Francisco Kjolseth | The Salt Lake Tribune Beaver County Commissioner Mark Whitney puts money on the table in support of legal defense for San Juan County Commissioner Phil Lyman. 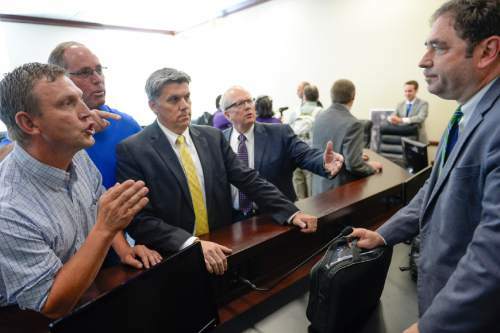 Members of Utah's Constitutional Defense Council met at the Capitol on Wednesday, June 24, 2015, to hear Kanab Republican Rep. Mike Noel make a case for setting aside money for Phil Lyman's legal bills. In the end it was decided that money will be raised by private donations. 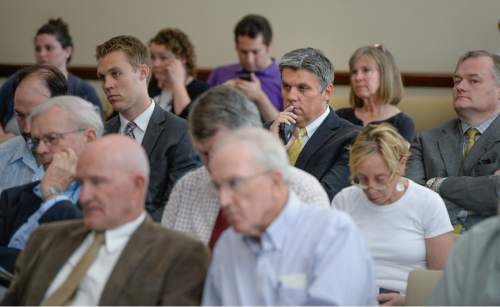 Francisco Kjolseth | The Salt Lake Tribune San Juan County Commissioner Phil Lyman, center right, listens as members of Utah's Constitutional Defense Council meet at the Capitol on Wednesday, June 24, 2015, to hear Kanab Republican Rep. Mike Noel make a case for setting aside money for Phil Lyman's legal bills. In the end it was decided that money will be raised by private donations. Francisco Kjolseth | The Salt Lake Tribune Conversation become a little heated as Iron County Commissioner Dave Miller, left, joined by Mark Whitney, San Juan County Commissioner Phil Lyman and Rep. Mike Noel, from left, speak with House Minority Leader Brian King, following a meeting by members of Utah's Constitutional Defense Council at the Capitol on Wednesday, June 24, 2015. Rep. Mike Noel tried to make a case for setting aside money for Phil Lyman's legal bills. In the end it was decided that money will be raised by private donations. Francisco Kjolseth | The Salt Lake Tribune San Juan County Commissioner Phil Lyman, left, joined by Rep. Mike Noel, R-Kanab, center, speaks with House Minority Leader Brian King, following a meeting by members of Utah's Constitutional Defense Council at the Capitol on Wednesday, June 24, 2015. Rep. Mike Noel tried to make a case for setting aside money for Phil Lyman's legal bills. In the end it was decided that money will be raised by private donations. 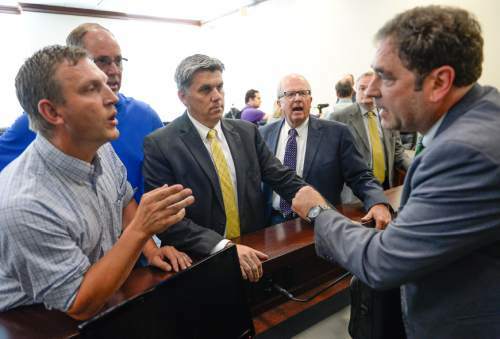 Francisco Kjolseth | The Salt Lake Tribune Conversation become a little heated as San Juan County Commissioner Phil Lyman joined by commissioners Dave Miller and Mark Whitney along with Rep. Mike Noel, from left, speak with House Minority Leader Brian King, following a meeting by members of Utah's Constitutional Defense Council at the Capitol on Wednesday, June 24, 2015. Rep. Mike Noel tried to make a case for setting aside money for Phil Lyman's legal bills. In the end it was decided that money will be raised by private donations. 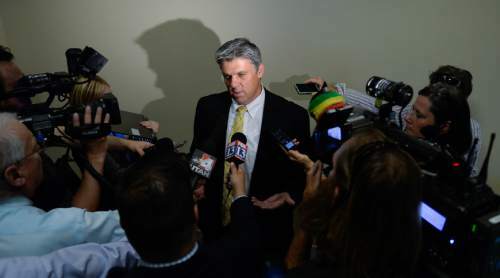 Francisco Kjolseth | The Salt Lake Tribune San Juan County Commissioner Phil Lyman speaks with the press as Utah's Constitutional Defense Council meets behind closed doors at the Capitol on Wednesday, June 24, 2015, to hear Kanab Republican Rep. Mike Noel make a case for setting aside money for Phil Lyman's legal bills. In the end it was decided that money will be raised by private donations. Francisco Kjolseth | The Salt Lake Tribune Garfield County Commissioner Dell LeFevre drops money on the table in support of San Juan County Commissioner Phil Lyman's defense. 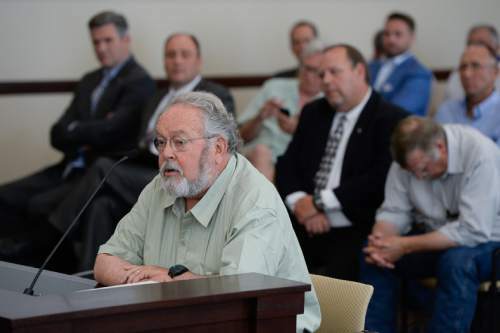 Members of Utah's Constitutional Defense Council met at the Capitol on Wednesday, June 24, 2015, to hear Kanab Republican Rep. Mike Noel make a case for setting aside money for Phil Lyman's legal bills. In the end it was decided that money will be raised by private donations. 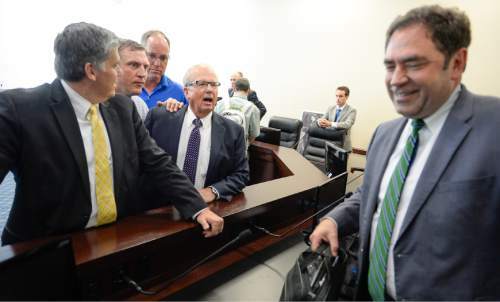 Francisco Kjolseth | The Salt Lake Tribune San Juan County Commissioner Phil Lyman exits Utah's Constitutional Defense Council meeting as they meet behind closed doors at the Capitol on Wednesday, June 24, 2015, to hear Kanab Republican Rep. Mike Noel make a case for setting aside money for Phil Lyman's legal bills. In the end it was decided that money will be raised by private donations. 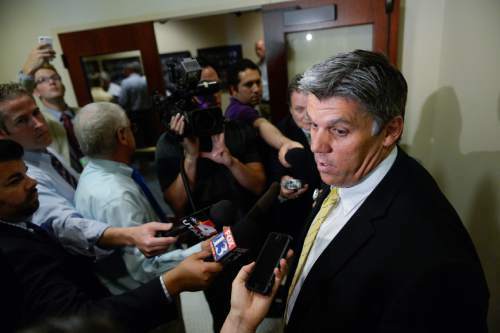 Francisco Kjolseth | The Salt Lake Tribune Phil Lyman answers questions at the State Capitol on June 24, 2015. 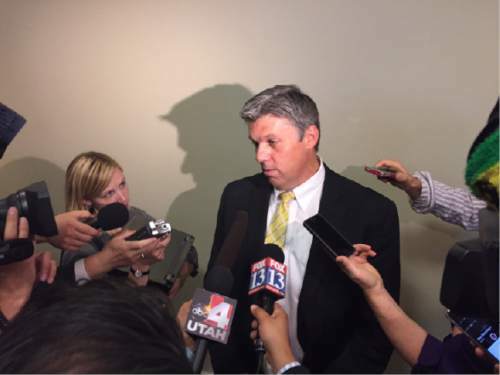 Francisco Kjolseth | The Salt Lake Tribune San Juan County Commissioner Phil Lyman speaks with the press as Utah's Constitutional Defense Council meets behind closed doors at the Capitol on Wednesday, June 24, 2015, to hear Kanab Republican Rep. Mike Noel make a case for setting aside money for Phil Lyman's legal bills. In the end it was decided that money will be raised by private donations. 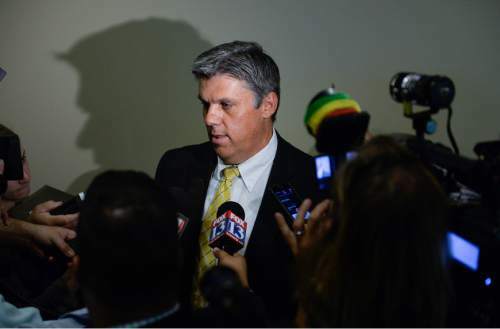 Francisco Kjolseth | The Salt Lake Tribune San Juan County Commissioner Phil Lyman speaks with the press as Utah's Constitutional Defense Council meets behind closed doors at the Capitol on Wednesday, June 24, 2015, to hear Kanab Republican Rep. Mike Noel make a case for setting aside money for Phil Lyman's legal bills. In the end it was decided that money will be raised by private donations. 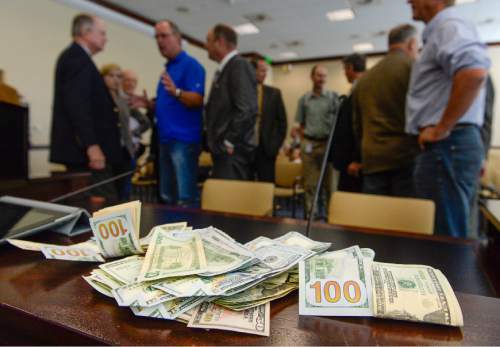 Francisco Kjolseth | The Salt Lake Tribune Supporters of San Juan County Commissioner Phil Lyman place money on the table following a meeting by members of Utah's Constitutional Defense Council at the Capitol on Wednesday, June 24, 2015, to hear Kanab Republican Rep. Mike Noel make a case for setting aside money for Phil Lyman's legal bills. In the end it was decided that money will be raised by private donations with many present making the symbolic gesture with cash. Francisco Kjolseth | The Salt Lake Tribune Conversation become a little heated as Iron County Commissioner Dave Miller, left, joined by Mark Whitney, San Juan County Commissioner Phil Lyman and Rep. Mike Noel, from left, speak with House Minority Leader Brian King, following a meeting by members of Utah's Constitutional Defense Council at the Capitol on Wednesday, June 24, 2015. Rep. Mike Noel tried to make a case for setting aside money for Phil Lyman's legal bills. In the end it was decided that money will be raised by private donations. Taxpayers won&apos;t be on the hook for Phil Lyman&apos;s legal bills after all. 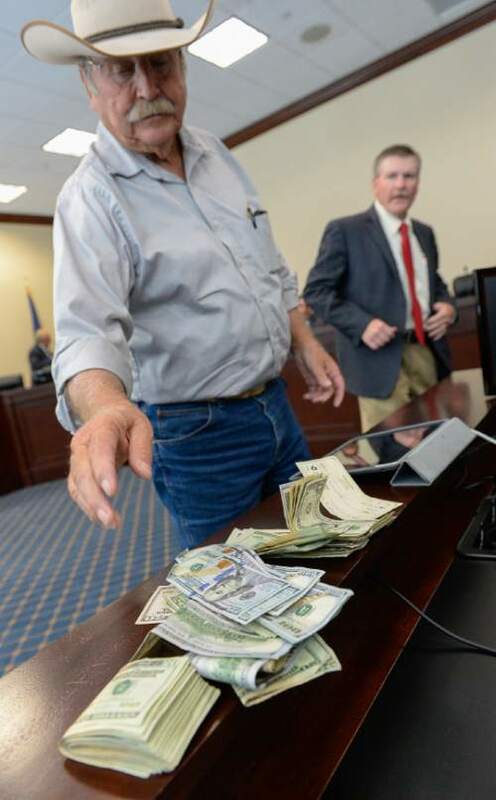 But the embattled San Juan County commissioner did walk out of a Capitol hearing room Wednesday with a handsome pile of legal tender, courtesy of his fellow county commissioners. 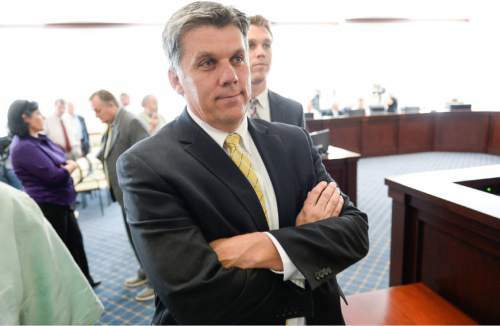 A flood of donations was unleashed during a tense meeting of the Utah Constitutional Defense Council after Lt. Gov. Spencer Cox described the legal and political pitfalls of using public money to help an official fight criminal charges. Cox said private money should be collected for Lyman, whom a federal jury convicted last month on misdemeanor conspiracy charges for leading last year&apos;s ATV protest into Recapture Canyon. Among the first to pledge were Gov. Gary Herbert, with a check for $10,000, and Cox, who added $1,000 to the money stacked on the speakers&apos; table. "We are proud to support one of our own," said Cox, himself a former Sanpete County commissioner. "Commissioner Lyman is one of the finest individuals I know. San Juan County is fortunate to have a public servant like him. "Were I in his situation, I would have done the same thing." The CDC  made up of executive branch leaders, lawmakers and county commissioners  gathered this week to hear Rep. Mike Noel&apos;s pitch for setting aside $100,000 to defray Lyman&apos;s expenses, which he said have already reached $45,000. Cox said he has "serious concerns about the way the case was handled and how it was ruled on." But, Utah&apos;s lieutenant governor said, many people have contacted his office, threatening to sue if the state spends public money on Lyman. The commissioner&apos;s legal tab has become a contentious sideshow in the Recapture controversy, which is itself a detour in Utah&apos;s battle to gain control over 30 million acres and 12,000 RS 2477 "roads" controlled by the Bureau of Land Management and the U.S. Forest Service. Noel argues prosecutors and U.S. District Judge Robert Shelby withheld "exculpatory evidence" during a trial in May that would have proved Lyman acted legally when he and fellow protest riders entered and exited the canyon on a road the county water district had an easement to use. The Kanab Republican believes Lyman&apos;s protest advanced a crucial state interest, so taxpayer money should be invested in his defense and possible appeal. House Minority Leader Brian King, D-Salt Lake City, strenuously objected. King said the council should limit its legal interests to civil matters. He said the state has little to gain from participating in Lyman&apos;s criminal defense. Besides, he noted, convicted defendants succeed just 3.7 percent of the time in the 10th U.S. Circuit Court of Appeals. "There is a 96.3 percent chance that the precedent is going to hurt us. We need to be wise and prudent," said King, an attorney who happens to be related to Lyman. "I am not interested in second-guessing a jury in this case. That&apos;s not our role. That&apos;s the role of the federal judiciary. "This is not a good battle to fight." 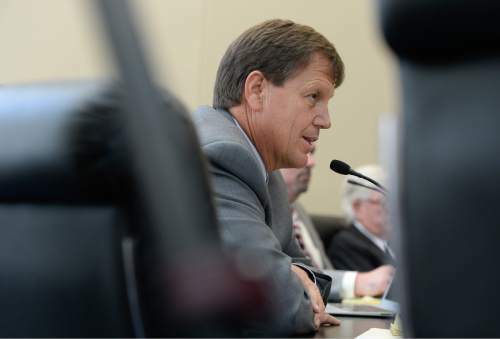 But the question of public funding for Lyman&apos;s defense became moot when the Utah Association of Counties formally withdrew its funding request moments after council members emerged from a closed meeting to discuss the idea. When it became clear the San Juan County commissioner would not get taxpayer funds, the meeting turned into a Lyman love fest. Speakers flogged the news media, environmental groups and the federal government as they emptied their wallets. Beaver County Commissioner Mark Whitney was the first. "I believe in Commissioner Lyman. He is a good man and he stands for a good cause," Whitney said. "I believe what he did was right for the health, safety and welfare of the citizens. "I&apos;m willing to start a fund right now to put money toward Phil Lyman&apos;s defense," he added as he dropped some bills on the table. Rookie Weber County Commissioner James Ebert borrowed $100 from another commissioner to add to the growing pile. And Garfield County Commissioner Leland Pollock said San Juan County residents all looked to Lyman "for help, begging him to do something about closed roads." "He will go to prison for his cause to help us," Pollock said. "He is a friend, and I&apos;m supporting him with my own money." Pollock deposited $1,000 on the stack, and Noel pledged a "fat check." "That conspiracy consisted of his right to conduct a public demonstration. You should take a look at a judge who would suppress free assembly," said Kane County Commissioner Doug Heaton. "The reason the Founding Fathers gave us a Second Amendment was if the First Amendment fails. "It is a chilling thing," Heaton added, "to see a fellow commissioner being prosecuted for fulfilling his duties." Shelby will sentence Lyman and co-defendant Monte Wells on July 15. The two face up to a year in jail and $100,000 in fines, as well as restitution associated with damage protesters allegedly caused to archaeological resources in the canyon just east of Blanding. The BLM closed the canyon to motorized use in 2007 to protect 1,000-year-old Ancestral Puebloan artifacts, middens, burial sites and dwellings. The decision has been a sore point for San Juan officials, who argue the BLM has taken years to consider their request to reopen the canyon. Lyman&apos;s supporters are upset that Shelby would not allow defense attorneys to put evidence before the jury showing that the BLM&apos;s closure was not valid. Over time, Lyman&apos;s defenders&apos; arguments have shifted from claims BLM leaders gave him conflicting messages before the protest ride to the water district easement and the county&apos;s claims to the road. At Wednesday&apos;s meeting, Noel honed in on a federal right-of-way law  a marker for states rights proponents and a potential point of entry in the case for the Constitutional Defense Council and the state. "If you say that road is closed, that puts in jeopardy every Title V right of way in Utah," he said. "[BLM officials] didn&apos;t follow with their own laws and regulations. That&apos;s the part where they will get caught with their pants down." Lyman, who attended the meeting, said he has never asked for state assistance and won&apos;t decide whether to appeal until he is sentenced. But the state, he said, should tackle "the larger issue." "I appreciate what Mike is trying to do. If you separate the two  my legal situation from the underlying issue  you are talking about a right of way that needs to be determined," he told reporters. "I would like to see the state get involved and try to get a decision," Lyman added. "That was the whole point of the ride. The [BLM] can&apos;t just designate something closed that is not closed." Lyman and his supporters say he limited his protest to an area where motorized use posed no threat to archaeological sites and where county officials regularly travel to service a pipeline under a long-standing easement. If that&apos;s the case, Lyman had lawful alternatives for challenging the closure other than organizing an illegal incursion, countered Patrick Shea, a former national BLM director. "A civil remedy was available on that road. That was the route he should have taken," said Shea, a Salt Lake City lawyer who defended Tim DeChristopher, the activist imprisoned for disrupting an oil and gas auction by winning leases with phony bids. "I have not seen nor heard Lyman saying, &apos;I&apos;m going to be held responsible for the actions I have taken,&apos; " Shea said. In the end, Noel was unable to persuade council members to dedicate public funds to the cause. But Lyman still left with a wad of cash. Meanwhile, the philosophical debate continued after the meeting adjourned. In an urban-rural split, Lyman and his supporters  including Iron County Commissioner Dave Miller, Beaver County&apos;s Whitney and Noel  faced off with King to continue arguing the finer points.